Our family, like many others, has a very busy schedule. Four kids with different activities, two parents with jobs and volunteer activities, and pets who require care and attention–all of these things intersect every day right around dinner time when everyone is, for a few minutes at least, in one place. Even though we’re busy, we cherish that half hour at the dinner together, and it’s important to me to develop healthy habits for my family. 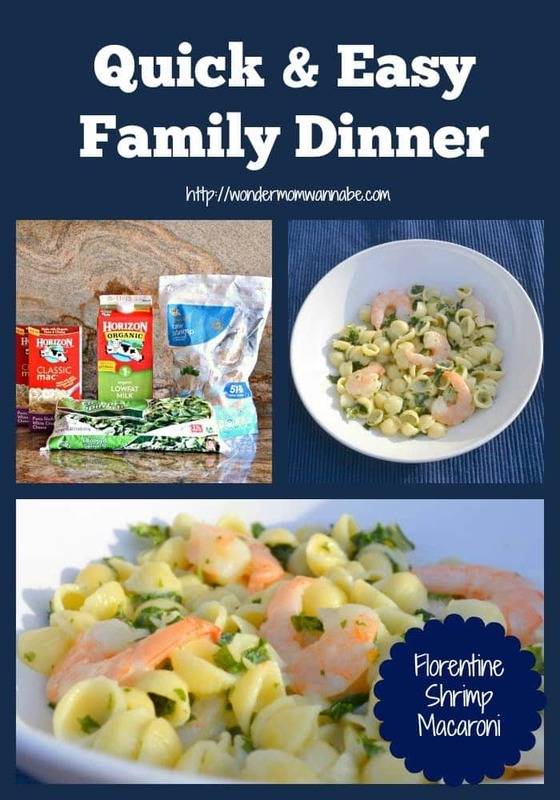 The problem is, because we are so busy, putting together a satisfying meal each night can sometimes be a struggle, especially if I am trying to please the diverse palates of my family members. That’s why I like to keep an arsenal of quick and easy dinner recipes so that even if I forget to pull something out to thaw in the morning I know I can get a meal together in under half an hour that I feel happy serving my family. Today I’m sharing my newest addition to my fast, easy dinner recipe bank. Five simple ingredients combine to make this kid-friendly classic that’s dressed up to satisfy mom and dad’s more sophisticated taste buds too. First, you gather up all the ingredients. We buy Horizon Organic milk because I don’t like my kids to ingest the added hormones that are in many other brands. I also prefer their mac and cheese because I know they only use real organic cheese and pasta. Then, I just needed shrimp, frozen spinach, and 1/2 a stick of butter (not pictured) to bring the meal together. Next, you boil the water for the macaroni. While you’re waiting for the water to boil, put the shrimp in a colander and run cold water over them to thaw them. Once the water starts boiling, you add the noodles to the water, put the spinach in the microwave to cook, and peel and devein the shrimp (unless you bought them already prepared). Once the noodles are ready, DON’T drain the water. Instead, add the shrimp to the pot to let them cook. Put a lid on the pot to hold in the heat. When the shrimp are done (should take just a few minutes but you’ll know because a few of them will start to float), drain the water. Then, add the milk, butter, and cheese packet to the noodles and shrimp and mix well. Finally, add the spinach, mix well and serve! 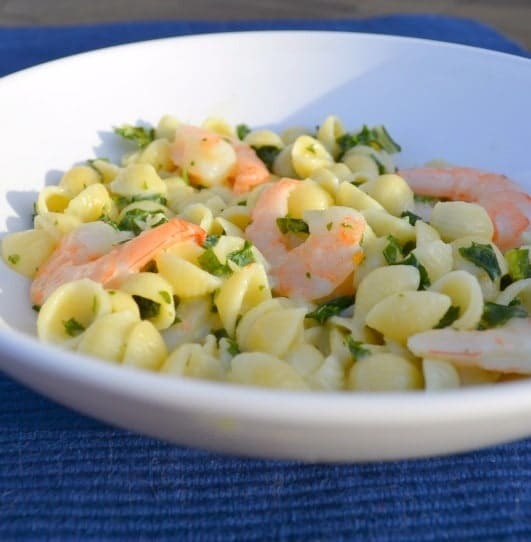 Bonus Meal Suggestion: Swap the white cheddar shells for Horizon’s elbow macaroni and mild cheddar, use broccoli instead of spinach, and substitute the shrimp with chicken and you have a second quick and easy dinner recipe! And because I have a stubborn sweet tooth, my entire family is spoiled into expecting dessert every night. Luckily, they are pretty easy to appease so I don’t have to whip up an elaborate confection each night. One of our favorites now that the weather has finally turned warmer is popsicles. You can skip a lot of the sugar and preservatives by making your own. I make mine with just two ingredients. I like to use 100% juice with no sugar added. 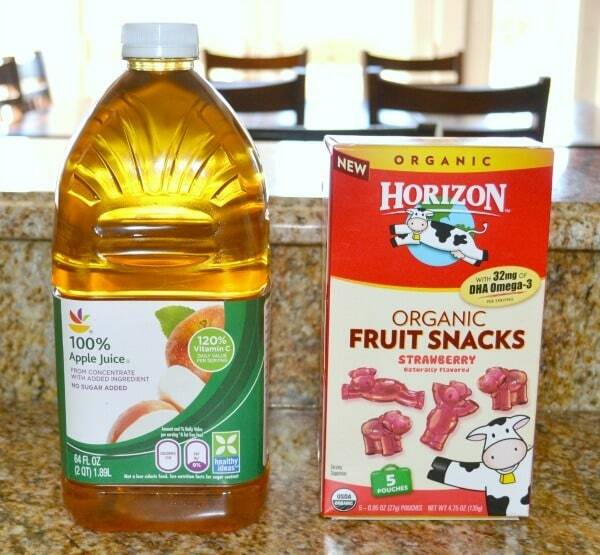 I also like to use organic fruit snacks like Horizon which are made from all natural ingredients. 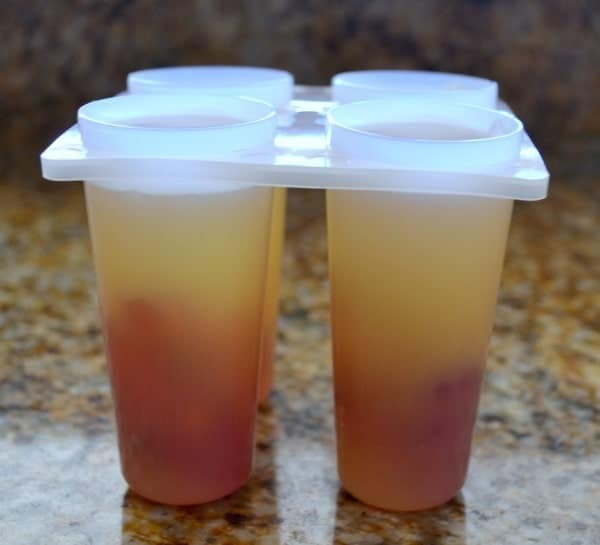 To make them, you just fill your popsicle molds with fruit snacks and then add apple juice. I hope these quick and easy recipes help make your family meal time less stressful. You can find more quick and easy recipes for your family on the Mealtime Solutions Pinterest board. For more information about Horizon Organic, follow them on Facebook. I saw “quick and easy” and had to click! I see you have organic ingredients…do you know where one could find coupons or sales for such items? p.s. I found your post via “Wonderful Wednesday Blog Hop” on Recipes for our Daily Bread. Hi Jennie, thanks for stopping by! 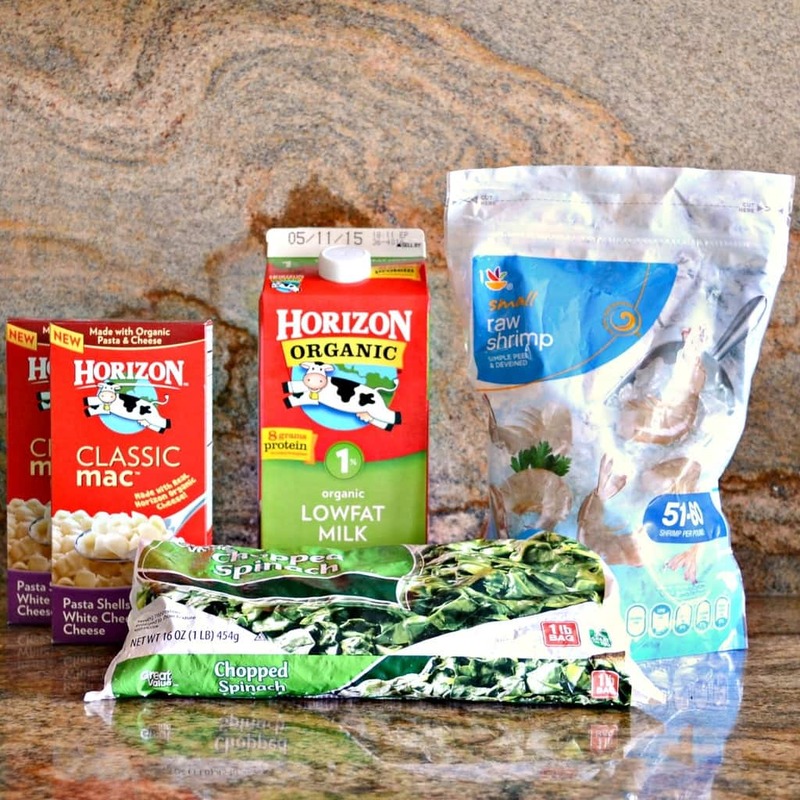 For coupons specifically for Horizon Organic, you can sign up at horizondairy.com or follow them on Facebook. I also love Coupon Cabin (http://www.couponcabin.com/) for finding coupons for a variety of products, including organic products. Love both of these recipes. We all love shrimp and I am always looking for new ways to make it. 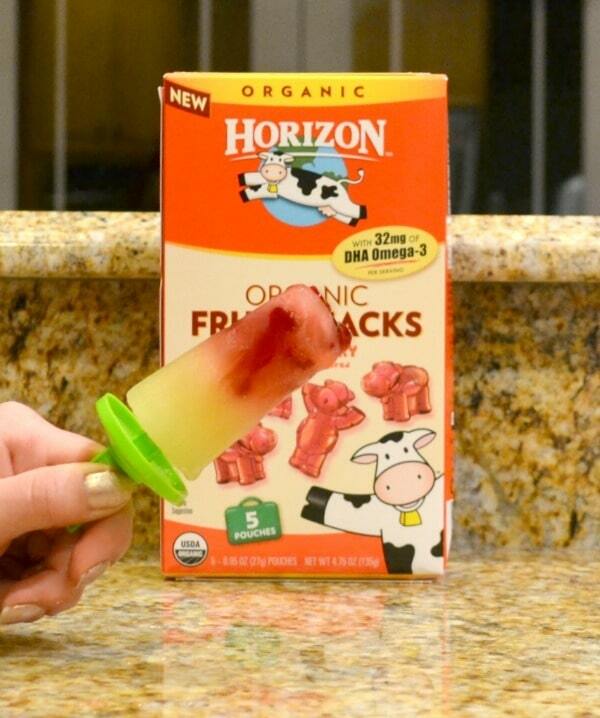 The popsicles are a treat that I would enjoy in the summer! So much fun! I hope you enjoy it as much as we did. Thanks for stopping by! I’m always on the lookout for new quick meals, too. My kiddos will agree with your daughter that the healthier fruit pops are fun. My daughter really wanted me to use lemonade instead of apple juice, which I agree would have tasted great with the strawberry flavored fruit snacks but you wouldn’t believe how hard it is to find lemonade that isn’t made with high fructose corn syrup!